That’s why I find that some of the worst places for comments tend to be old-line media sites. In my opinion, the old-line media is really still stuck on the idea that it’s asymmetrical and that when people respond, it’s in the old “letters to the editor” sense. For a long time, they didn’t get and they still don’t get that instantaneous communication, if left unchecked or unmoderated, will quickly go down to a lowest common denominator of people yelling at each other. If you go to a newspaper site and look at the comments on any kind of article there, it’s usually toxic spew followed by toxic spew. My experience with newspaper comments totally jives with Scalzi’s, but I think worse than not moderating comments is deleting comments in an effort to silence discussion on a specific topic. We had a big fire downtown on Memorial Day in a 100-year-old building. When I heard that the Mayor (who is also a prominent businessman) had recently bought the building, I jokingly said “must be arson!” Turns out, I was right. 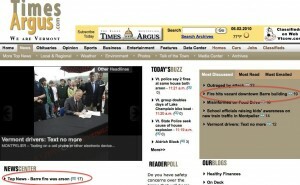 My local paper, the Barre-Montpelier Times Argus reported the story (and here) and, as always, had comments open on it. Discussions in the comments section of Times Argus articles tend to be very polarized and full of vitriol. I honestly don’t know why most of the people bother to comment at all, since it’s not like they’re dealing with reasonable individuals. Not surprisingly, a few people commented on the story and suggested that the Mayor had the building burned down. Others defended him. All of a sudden, the comments disappeared and there was no space where people could post comments anymore. You could see on the front page that it was one of the most discussed stories, with 19 comments (the other had 17), but those comments had disappeared, replaced by nothing. No note explaining why they did it. The comments were just gone. I’ve seen some of the most horrible comments on this newspaper website. People blaming a mother whose three-year-old was hit by a car. People writing offensive things about gays and lesbians. People saying awful stuff about a teenager who’d just died in a car accident. None of those conversations were moderated in the least. In fact, I’ve never seen anything deleted from the comments. But now, instead of moderating a conversation about a fire that destroyed a local landmark, they simply make all of the comments (some completely innocuous) disappear. This is not how you treat your readers, especially your “super users” who probably visit the site many times each day. I can understand moderating comments that suggest that the mayor might have been involved in criminal dealings and lack any proof, but there were plenty of comments that suggested nothing of the kind. Also, if you get rid of any comments, you should be transparent about it — make it clear that you did it and (ideally) explain why. This isn’t moderation for the sake of creating a safe and welcoming community space (which should always be the primary purpose of moderation); this is censorship to stifle conversation about a topic they don’t want conversation on. I ends up looking like they have zero respect for their readers and that they’re simply paying lip service to social media. And I doubt that’s too far off from the reality. This is a good lesson for anyone who runs an online community. Moderating comments is ok. In fact, it’s critical to moderate comments in order to create the sort of environment where everyone feels comfortable posting comments. But you want to be consistent. You don’t want to let offensive comments go on one post and then delete them from another. And you definitely want to keep comments open on everything, not just those things you’re comfortable having people discuss. When you do delete something, you want to explain why you did so — transparency is critical. While you might be the moderator, you’re not the boss. In fact, you exist to serve the community. You need to make participants feel like it’s their community; you need to show respect for them and keep the lines of communication open. Respect your users and they will respect the community. You might own the site and be paying for the server space, but if you treat it like it’s your community, you will never create the successful community you want. I’d agree with that Olivia. Jessamyn does an amazing job as the moderator at Ask Metafilter and the NY Times is one of the few newspapers I know of that really do any relatively thoughtful moderation of comments. I hadn’t seen that NY Times policy before, but now that I’m looking at it, I realize that it’s identical (or nearly identical) to the one on the Times Argus site. I wonder if they just stole it from the NYT (since I’m sure it’s not the other way around!). 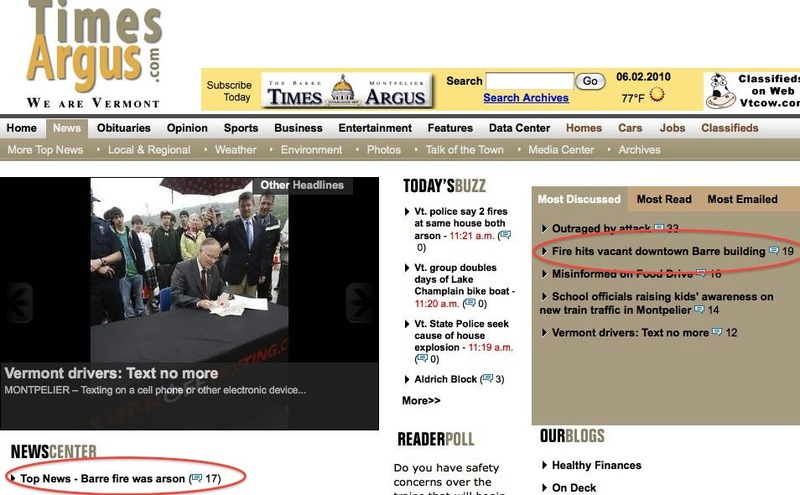 I suspect the newspaper was worried about libel suits since the comments were appearing on their web site. It’s one thing to say offensive things about a group of people; it’s another to accuse a specific person of a crime. Right, but that’s what moderation is for. You can delete a comment and write “this comment has been deleted because it has violated our policy, yadda yadda” and still keep the legitimate comments.